Shark Rocket Complete with DuoClean - Best stick or just a lemon? 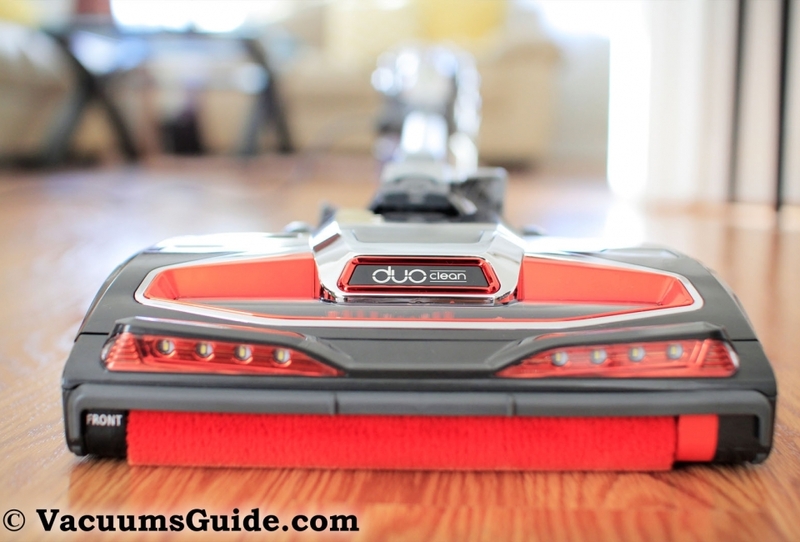 Vacuums Guide » Reviews » The new Shark Rocket Complete with DuoClean – Is this the best stick on the market? The new Shark Rocket Complete with DuoClean – Is this the best stick on the market? Featuring lots of attachments, a completely redesigned brushroll as well as minor improvements to the already mature technology deployed by Shark on its older Rockets, the Shark Rocket Complete with DuoClean is a nice piece of cleaning equipment. The product gets extra points for a neat design and for the quality of the materials. I recommend this to anyone interested in an up-to-date versatile lightweight vacuum cleaner. Before we dig in, I would like to point out that unlike other similar units, you can vacuum with this product basically every type of surface. That is one of the main reasons I chose to review it. You can clean hardwood floors, roof fans, window ledges, cabinets, curtains, and vents. You can even use it to vacuum your car, or your mattresses. I like this kind of versatility; it attracts me and I’m sure there are many others who feel the same. The soft brushroll has a pull effect, gathering all the particles it can reach. The bristle brush agitates the dirt, sending it directly into the air flow. The strong motor offers a great suction. This Rocket offers 2 suction modes, just like the HB320 line: you can use the first setting for bare floors and small area rugs, while the second setting unleashes the full power of the motor, making it appropriate for cleaning high pile carpet. The motor has been improved and consumes 600 watts, 100W more than the HV320 series. Holds 0.25 gallons (1 dry quart) – the same amount of debris as the HV320 series, twice as much as the HV300 series. It’s enough to vacuum 5-6 rooms without any issues (depending on the frequency you clean your home). The container is easy to empty and clean. Filtration was never a strong point of the Rockets. The Rocket Complete makes no exception. The vacuum comes with 2 regular filters, one pre and one post motor. One is made of felt, and the other is made of foam. These are washable and should be cleaned regularly. Measures 9.84 x 10.24 x 46.46 inches and weights 9.9 lbs when it’s completely assembled (when in hand vac mode, it weights about 5 lbs). It’s a bit heavier than the previous versions, but having a weight under 10 lbs in a corded vacuum is enough in my opinion. Depending on the place you purchase the unit, SharkNinja may offer a limited VIP lifetime warranty if you buy it directly from their site, or 5 years if you purchase the product from 3rd party wholesalers. Think about your options well: there may be cases when you would be more protected by shopping from serious companies such as Amazon. This vacuum effortlessly changes over to a handheld, making stairs or more complex floor surfaces simple to clean. The LED lights on the nozzle allow you to spot concealed debris and dust. Surprisingly, the Shark Rocket DuoClean is not as noisy as the previous Rocket versions. The length of the power cord was maintained to 30 ft which translates into a spacious cleaning radius. Holding the ergonomic handle allows the owner to smoothly control the appliance. The swivel steering is another element that adds up to usability. Storage is simplified with the wall mount. Depending on the model you choose, expect to pay anything between $200 and $300 for a Shark Rocket Complete. Here’s a deal which you may want to check out. What do you think about the new Rocket? Would you get this? Have one and care to share your experience? Use the comments form. I would not have any other vacuum. My 382 does everything a $1000.00 unit could do and more. If you are looking for the best vacuum ever made, buy the Shark Rocket 382. I just bought it yesterday and am using it today. We never tried a stock vacuum like this before. It seems to work great BUT…..it is very noisy! A really high pitch loud noise that jis pretty piercing. Anyone else have this problem? I have the NV652, and I really like it! I saw the new duo-clean head in a television commercial, and I want to know if one of the duo-clean heads will fit on my NV652. If one of them will fit, I might consider trying to buy a duo-clean head as a “part”. Thank you for any help you can give me. That’s not an option, unfortunately. It’s a Rocket, so yes, there is a difference. However, the particle agitation makes up in most of the cases. I received my Shark duoclean a few weeks ago and have been putting it to the test daily. I run a home cleaning business and have 2 cats and 1 large dog at home, so the bar has been set high for what I expect. I’ll give it to you straight.. this vacuum is fantastic!! I haven’t used my Dyson upright since I bought this thing. It’s just so convenient with the wall mount and it’s light weight. This thing performs well on all surfaces, not just ok on one or the other. I’ve already ordered a second for my business because it replaces several tools and is less tiresome to use. Can’t say enough good things about this piece of equipment. My only negative is that it doesn’t have the ability to turn off the brush rolls, and it doesn’t have a hepa filter. I’ve had this for 9 months and I’m not that impressed. They need to do something about the cord. I don’t like the unit on the top. If you are using any of the attachments, the unit is very heavy to hold up. The canister is very small and has to be emptied frequently. The attachments are okay, nothing special. The under appliance wand is really only for a range/stove. Forget about using it under your fridge. I can get under my stove if I remove the drawer. I can’t clean under my fridge without moving it and even then i can’t clean the coils underneath. I don’t think the vacuum picks up on floors that great. I have to go over an area several times and it still doesn’t clean the floor. It’s good on carpet, but I only have one room with carpet. Don’t let it get near your throw rugs or it will chew them up. Honestly, I have a Hoover Linx cordless hand vacuum that has more suction than this and it doesn’t chew up my area rugs. My husband wanted this. I would rather have a small ShopVac, it’s wet/dry, has great suction, and has a decent sized collection bag which I would prefer anyway because of the dust, etc. Vacuums.” CR classifies the Shark Rockets, including the HV380 series as sticks. The only problem I have found is that the smaller cleaning utensils do not have pivoting heads to maintain vacuum contact. You have to angle the whole unit to the fixed utensil’s angel. Other than that, they are great small units. Roland M., University Custodian.